There's a lot of pressure that comes with trying to simplify. Not externally, but from ourselves. We look around at far more developed 'simple living' practices and feel that we're not doing enough. We look at the perfectly organised, minimalist cupboards and think guiltily of the topsy turvy pile of stuff at the back of the wardrobe. And every step can be fraught with not-good-enough not-fast-enough not-frugal-enough challenges. I'm really beginning to accept that this journey takes time, takes patience, and will also probably involve quite a few more tantrums. This is why I really like Amanda Soule Blake's recent post about getting past her spinning block. We need to let go of the idea that everything must be perfect, and accept that learning and experimenting will mean some yarn that can't be used, some bread that can't be eaten, some clothes that can't be worn. 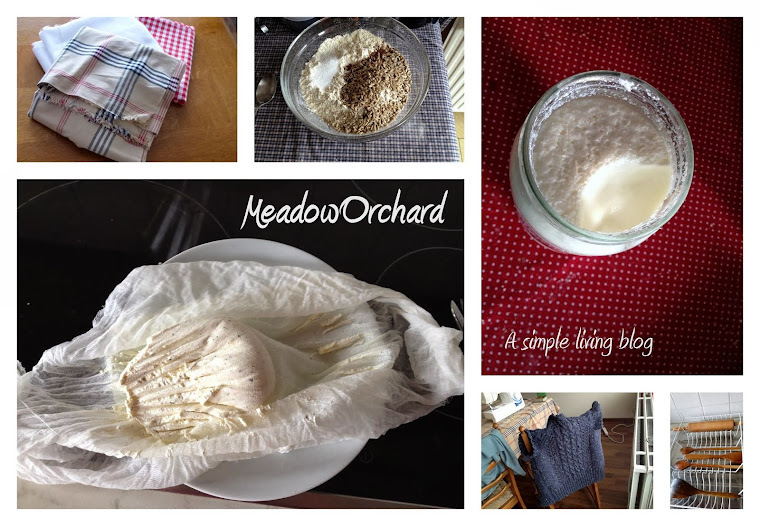 With this approach, I have this week vemtured my first ever attempt at making cheese. I found a recipe online that seemed the very simplest imaginable, in techniques, labour, ingredients and equipment. I am reluctant to invest money and space in a new kit before I know if this is a craft I will really use, but this recipe (Hugh Fearnley-Whittingstall, published in The Guardian) seemed very doable. Basically, mix yoghurt with spices and leave to drain. That's kind of it. The main challenge was finding a set-up allowing this to drain in the fridge for several days. I used a mixing bowl and wooden spoon but think next time I'll use a jug (smaller surface area needed) and cover it with a bit of tin foil to prevent the whole fridge from smelling a bit yoghurt-y. (I actually quite like the smell - tangy - but my boyfriend was less enamoured). This morning I took the cheese out and put it in a clean jar with some olive oil. I think maybe it should have drained a little longer, as it was still quite wet, and I think maybe I need to try different ways of packing it to reduce the amount of olive oil used. I'm using the whey to bake bread. (I was thinking of trying to make ricotta with the whey but decided to tackle one challenge at a time. Maybe when I get the hang of this cheese I can start experimenting with the next one! Any favourite combinations or other suggestions? Have I tempted you to have a go at this?